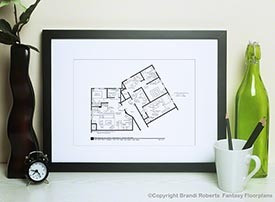 Buy a poster of The Sopranos house floor plan! 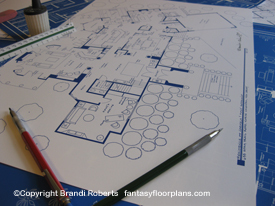 This is my fictional first story floor plan of Carmela and Tony Soprano's house from The Sopranos. Step into the foyer and you are greeted with corinthian columns, high ceilings and marble floors. Through the foyer you enter the rather grand living room. Flanked by french doors, hardwood floors, high ceilings and a built-in bar for entertaining friends and family. The kitchen sports a large island and bar with stools for dining. Next to the kitchen is a breakfast area and sunroom. The expansive dining room features pocket doors, a large window and half columns with storage inside. Outside you'll find a terrace with built-in grill and patio. The den is just off the kitchen and features a fireplace, built-in bookcases and tv console. On the other side of the house is Tony's office. 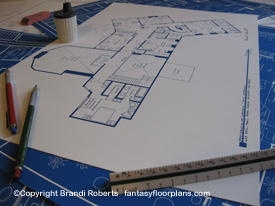 The breezeway and second garage are not pictured on my drawing. Pair it with my second story of The Sopranos house floor plan for the complete set!